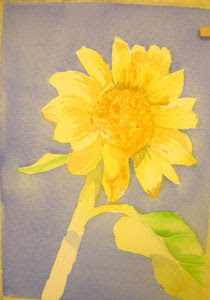 Using New Gamboge and Quinicridone Gold, I am beginning to add some color and texture to the sunflower head and petals. I use my Brush Dance and the Pull-Push Stroke for this technique. These are shown in detail on my DVD (http://watercolorworksart.com/Classes). For both of these strokes I hold my number 10 round brush nearly straight up and down. The Brush Dance is just a bouncing, scribbling motion made while holding the brush with a very light touch. The Pull-Push Stroke is executed by holding the brush close to the bristles, nearly straight up and down, and gently (light touch) pulling the brush, and then gently adding pressure while pulling it. These strokes are both fun ways to make beautiful marks on your paper!